I can certainly attest that depression was a constant companion for me while I was in the throes of thyroid dysfunction. I often felt angry and overwhelmed at life and would find myself crying for no reason. If you've struggled with depression as well, I'm sure you know that it can take a toll on your relationships, your energy levels and your ability to enjoy life. One nutrient in particular, however, can go a long way in turning the tide of not only depression, but lethargy, sluggish digestion and dry, thinning hair. That nutrient is your new best friend: vitamin B12. Signs of vitamin B12 deficiencies include fatigue, muscle weakness, brain fog, difficulty concentrating and poor memory. Sounds alot like thyroid dysfunction, doesn't it? In fact, the signs of vitamin B12 deficiency are so vague and varied that they are often overlooked or blamed on other conditions. Prolonged vitamin B12 deficiency, however, can lead to serious health consequences, including nerve damage. If you suspect you might be deficient in vitamin B12, it's time to start paying attention to you B12 levels so you can improve your mood and your energy and stay healthy for the long term. What Leads to Vitamin B12 Deficiency? So, why is vitamin B12 deficiency so darn common? While diets high in grains and low in quality animal products can lead to lower levels of this nutrient, there are a few specific reasons why you might be deficient in Vitamin B12. Low stomach acid is another reason for deficiencies of vitamin B12. What does stomach acid have to do with vitamin B12, you ask? Vitamin B12 is absorbed in the stomach in the presence of stomach acid and the transport protein Intrinsic Factor (IF). Intrinsic Factor has one important job- grab onto vitamin B12 and transport it to the gut where it can be absorbed and utilized by the body for energy production. 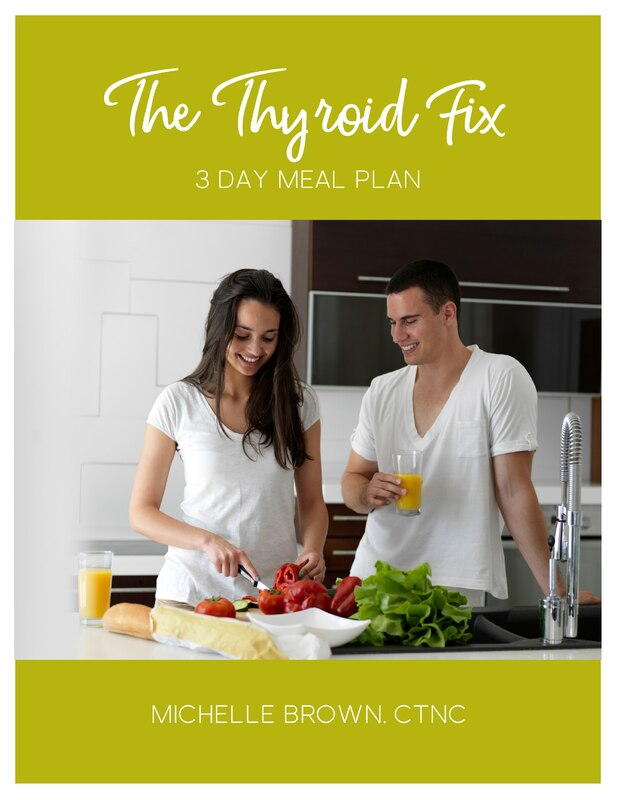 Unfortunately, low stomach acidity is a common issue for women suffering from thyroid disorders and it can seriously dampen the amount of B12 that is absorbed from food. Because underlying infections, like H. pylori, can contribute to low stomach acidity, it's best to address the underlying factors for thyroid dysfunction and depression. Medications, including diabetes drugs, like metformin and PPI's and other acid blocking drugs, can interfere with the absorption of Vitamin B12. The reason why acid blocking drugs dampens vitamin B12 absorption should be obvious by now-- these drugs block stomach acid, and thus Intrinsic Factor, which we know now are vital players in transporting B12 to the gut where it can be absorbed and utilized for cellular energy. Vitamin B12 supports a healthy mood through two main jobs. First of all, vitamin B12 supports healthy methylation. If you've heard of methylation, you may know that it's an important part of detoxification. When our detoxification pathways are sluggish, toxins can build up in the brain and other organs, leading to a host of ills, including depression and anxiety. Vitamin B12 also plays a role in the recycling of hoscysteine, an amino acid that is a biomarker of inflammation. High levels of homocysteine are not only a risk factor for inflammatory diseases like heart disease- they are also implicated in depression. By keeping homocystein levels in check, vitamin B12 can help dial down inflammation. The best place to start increasing your intake of vitamin B12 is with food. As previously mentioned, animal products, such as red meat, poultry, eggs and fish, are the best sources of vitamin B12. Beef liver is a particulary good source of vitamin B12, as well as vitamin A and other trace minerals. Supplementing with B12 may be necessary to reach optimal levels as well. When choosing a vitamin B12 supplement, be sure to look for methylcobalamin. This is the active form of vitamin B12 that is readily absorbed by the body. Cyanocobalamin- the alterate form of vitam B12 you will often see- is the synthetic form of B12 and may not be well absorbed. 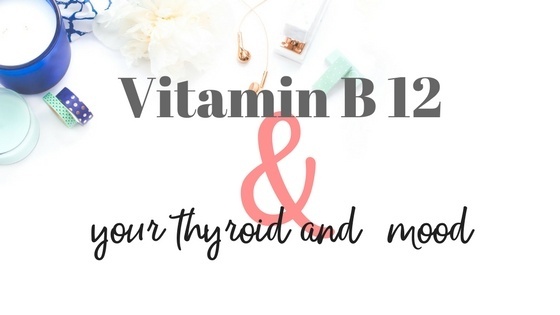 Many B12 supplements are meant to be dissolved under the tongue so that they bypass the stomach and can enter the bloodstream without the added step of pairing up with Intrinsic Factor in the stomach. These supplements might be a good idea if you know you have low stomach acid and are concerned you won't be able to properly absorb B12 in the stomach. For those who show a serious deficiency in vitamin B12 (diagnosed through a simple blood test), injections of B12 are very effective. Whichever method you use to meet your vitamin B12 needs, just make sure to stay consistent. This is one nutrient that you don't want to be deficient in. At the same time, it's important to address the underlying causes of any nutrient deficiency. 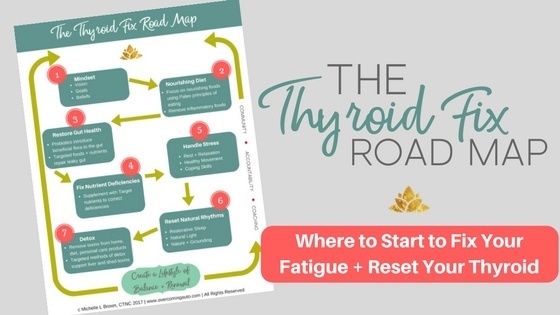 Check out my Thyroid Fix Roadmap to get started with addressing your underlying factors for fatigue, irritability and brain fog. 1. D. Degner et al., "Association between Autoimmune Thyroiditis and Depressive Disorder in Psychiatric Outpatients, Eur Arch Psychiatry Clin Neurosci 265, no 1 (February 2015): 67-72, doi: 10.1007/ s00406-014-0529-1.